The Dream Garden provides a space to rest and relax. From March 22nd to the 25th, the new CE Centre on Uplands drive hosted the Ottawa Home and Garden show. With lots of room inside, the CE centre allows for a much more unified show than Landsdowne Park. Aside from venue, the main difference between this show and the Ottawa Home and Design show is that the latter has more interior design, and this one has a lot of temporary indoor gardens and smells way better! Shower panels at the Mondeau booth. There are couple of good reasons to go to shows like this: if you’re looking for ideas, want to get a sense of what services are available locally, or you’re looking for a deal from a known provider. 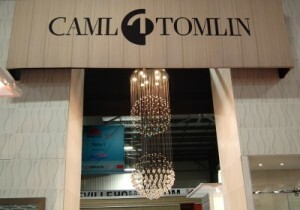 For those who’ve never been, a home show is an enormous concentrated indoor market. In spite of the fact that they’re not really aimed at DIYers, I like to go to them occasionally because I’ve run into products I haven’t considered before. Sometimes, looking through magazines and the internet just isn’t enough. Congratulations to Caml-Tomlin for finding a chandelier I don’t hate! 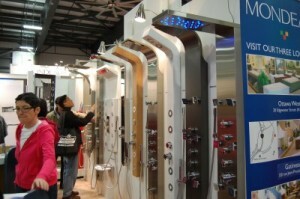 At this show there were a couple of clever products I learned about, the first being Krumpers Solar blinds. The solar blinds are a simple yet brilliant way to control indoor temperature without using HVAC systems. Vertical rolling blinds made of a metal mesh, they are reflective on one side and black on the other, designed to be reversed when the seasons change. In summer, the metallic side reduces indoor heat by inhibiting passive solar gain (the “car in the sun” effect). In winter, the black side absorbs heat from the sun’s rays, helping to raise indoor temperature. An interesting aside: in discussing their application as a privacy screen for the interior, the European salesperson remarked that Europeans in general didn’t mind the “goldfish bowl” feeling that comes when the interior of the house can easily be seen by neighbours or passers-by. In Europe, people leave the shades open most of the time, as this creates a feeling of safety and community. Shyer Canadians will definitely want an additional window covering, especially for night-time privacy. 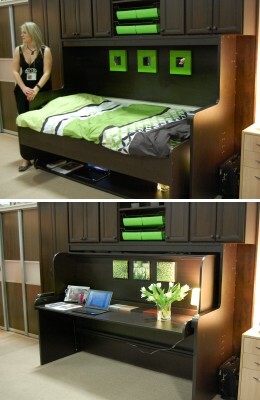 This bed folds away and pulls the desk into position at the same time. The second great idea was the hide-away bed from Capital Closets. In essence a shelving unit with an integrated Murphy bed hinged on its side, the real eye-opener of this application was that the bed didn’t just fold up out of the way, but that there was a fully laid-out desk that appeared as well. The other thing that impressed me was the ease and smoothness of the hinged transition. While the booth operators lifted the bed up and down over and over again, the items on the desk never budged – including the water level in the vase. This would be a great idea for guest sleeping or a space-deprived child’s room. It actually looked like a six or seven year old could fold the bed away easily. One display I spent some time in was the Dream Garden put together by Davis Landscape and Permacon, which I found by following the intoxicating scent of cedar mulch. The garden was full of live plants and a working fountain, and we spent some time there relaxing and getting away from the crowds. The winner for charming moments happened at a giant display of mattresses bigger than the square footage of my house. The awesome part was that every mattress had people sitting or lying down on them, and some folks looked relaxed enough to take a nap. The best booth swag ever was handed out by Ottawa Cedar Lumber: a small cedar plank ready for salmon grilling. I couldn’t help lifting the plank to my nose and inhaling the fantastic aroma as I wandered the rest of the booths! For those who don’t know, keeping cedar in your drawers or closets discourages insects and gives a nice fresh smell. For me the highlight of the event was gardening expert Mark Cullen, who was very impressive as a speaker. Personable and warm, he was also funny and of course extremely knowledgeable, with tons of excellent advice in response to audience questions. 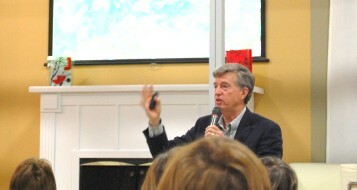 His presentation was excellent – covering gardening trends for 2012 (food gardening and green walls), garden inspiration (from Monet’s garden at Giverny to shots of ordinary Canadian homes with extraordinary front gardens). The great thing about Mark’s approach to gardening is that he stresses both environmental responsibility and great results, and he’s a fan of both ornamentals and edible gardens. A staunch defender of the lawn, he says that you can have a great lawn that is eco-friendly by keeping the grass about 3” long, and trimming frequently with a push mower. He also says you should leave the trimmings where they fall, as they return nitrogen to the soil. Mark’s number one tip for great gardens? Amend your soil every year with an inch of 70% composted manure mixed with 30% sand. I really wanted to stay for Brian Baeumler’s presentation, but the stampede of visitors made me afraid for my life. Judging from the laughter and applause, he was very good. My recommendations for the organizers remain the same as for the Ottawa Home and Design Show: more food, some wine, and music – in general, more event. For this particular show I would add a request to invite some architects and designers, and turn the marketplace into more of a marketplace of ideas. I think what I want is more elements of a conference, perhaps, with lectures and presentations (which I would gladly pay more for). I would love for an event like this to become a way of bringing together the interior and landscape design community in Ottawa. My recommendations for show attendees: go early, and schedule your time around the speakers you want to see. Don’t waste your time with the food.